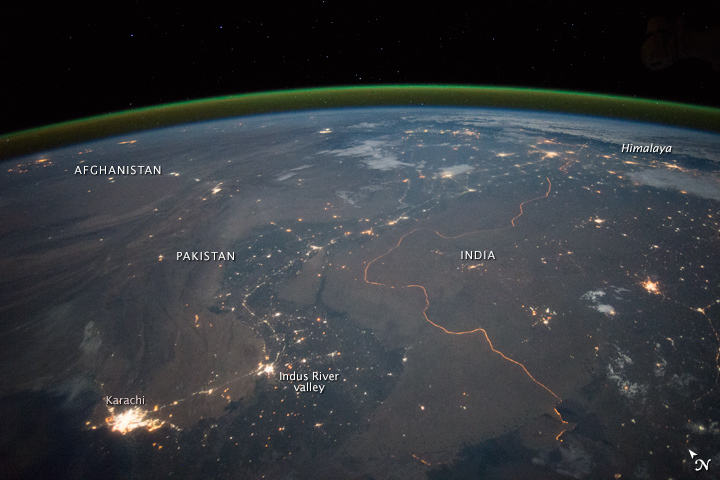 An astronaut aboard the International Space Station took this nighttime panorama while looking north across Pakistan’s Indus River valley. 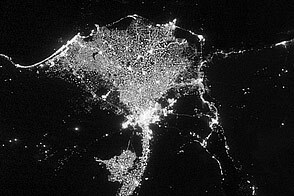 The port city of Karachi is the bright cluster of lights facing the Arabian Sea, which appears completely black. 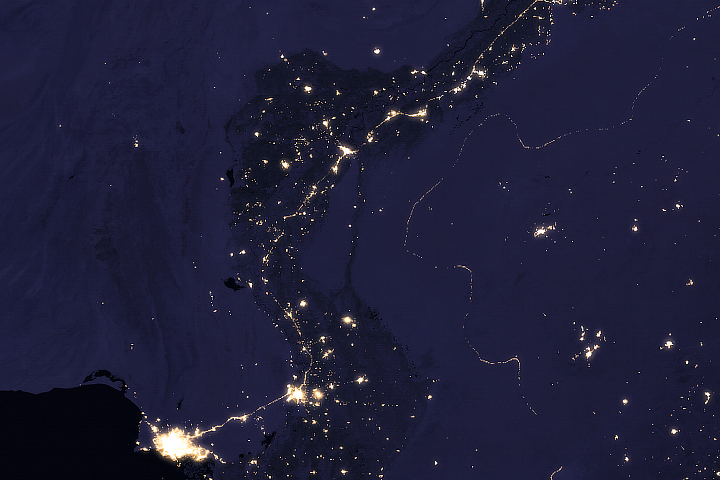 City lights and the dark color of dense agriculture closely track with the great curves of the Indus valley. For scale, the distance from Karachi to the foothills of the Himalaya Mountains is 1,160 kilometers (720 miles). 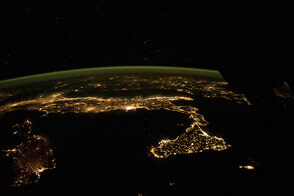 This photograph shows one of the few places on Earth where an international boundary can be seen at night. The winding border between Pakistan and India is lit by security lights that have a distinct orange tone. 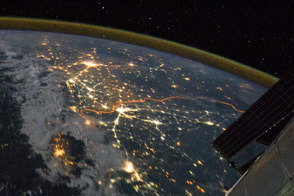 Another night image (click here) shows the border zone looking southeast from the Himalaya. A daylight view shows the vegetated bends of the Indus Valley winding through the otherwise desert country. More than two millennia ago, Alexander the Great entered the Indus plains in 327 BCE from the northwest. He then spent many months leading his army and navy down the length of the Indus valley shown in this view. From near Karachi, he then began the desert march back to Mesopotamia (modern Iraq). By contrast, it takes the space station just three minutes to travel this distance. Astronaut photograph ISS045-E-27869 was acquired on September 23, 2015, with a Nikon D4 digital camera using a 28 millimeter lens, and is provided by the ISS Crew Earth Observations Facility and the Earth Science and Remote Sensing Unit, Johnson Space Center. 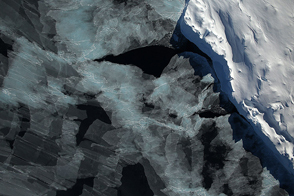 The image was taken by a member of the Expedition 45 crew. The image has been cropped and enhanced to improve contrast, and lens artifacts have been removed. The International Space Station Program supports the laboratory as part of the ISS National Lab to help astronauts take pictures of Earth that will be of the greatest value to scientists and the public, and to make those images freely available on the Internet. Additional images taken by astronauts and cosmonauts can be viewed at the NASA/JSC Gateway to Astronaut Photography of Earth. 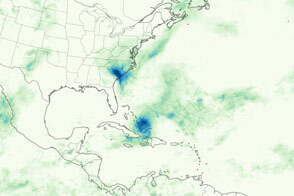 Caption by M. Justin Wilkinson, Texas State University, Jacobs Contract at NASA-JSC. This photograph shows one of the few places on Earth where an international boundary can be seen at night.